Itchy skin, medically known as pruritus, can be extremely uncomfortable and frustrating. There are many causes of itchy skin on the neck, including environmental and internal factors. 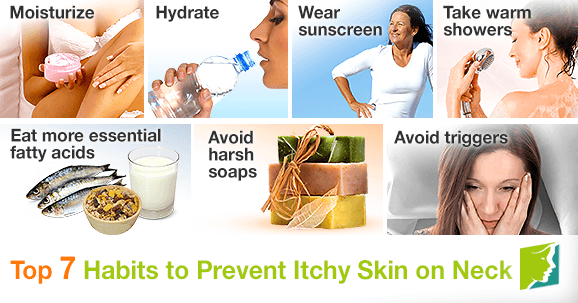 Fortunately, there are many easy habits to prevent itchy skin. The body produces natural oil, called sebum; when the body is depleted of sebum, the skin dries out and becomes itchy. Itchy skin can be isolated in certain areas or affect the whole body. There are several causes of itchy skin that can be either environmental or internal. Environmental causes include harsh weather, low humidity, washing or bathing too often, or excessive use of air conditioning or heating. Internal or medical reasons for itchy skin include hormone imbalance, eczema, psoriasis, chickenpox, hives, or thyroid problems. Coconut oil or other natural moisturizers are effective for hydrating skin and preventing itchiness. It is recommended to generously apply moisturizer to the entire body after showering. It is also helpful to wear socks and cotton clothing to bed to help retain moisture. Staying hydrated not only helps keep the body healthy and improves functions, but also helps keep skin moisturized. The recommended amount of daily water consumption is approximately eight glasses. It is helpful to keep a reusable water bottle with you at all times to remind you to keep drinking throughout the day. Above all else, protecting skin is the best prevention method of itchiness and dryness. Dermatologists generally recommend wearing sunscreen everyday (even when it is not sunny) of SPF 15 or higher to protect skin. Hot showers should be avoided in order to prevent dry, itchy skin, as the hot water severely dries out skin. Taking a warm bath with soothing oils like lavender and rosemary is also helpful for improving skin health. Omega-3 fatty acids promote skin health. Salmon, walnuts, and soy are all rich in beneficial fatty acids that will nourish skin. Using mild (non-overly scented) soaps when showering and washing your hands is gentle on the skin and will prevent it from drying out. Factors like excessive sun exposure, smoking, excessive stress, and inconsistent sleeping patterns can cause itchy skin on the neck. It is best to avoid these triggers or at least keep them to a minimum. Itchy skin, particularly on the neck, can be irritating and uncomfortable. Things like hot showers, too frequent washing, cold weather, and harsh soaps can cause itchy skin on the neck. It is important to practice healthy habits to prevent itchy skin. These habits will help protect skin and keep it healthy while preventing itching and dryness. Read more about habits that trigger itchy skin. In addition to symptoms such as hot flashes, mood swings, and general aches and pains, many women suffer from itchy skin rashes during menopause. Itchy and dry skin is not usually associated with menopause, but skin problems are a frequent symptom experienced by menopausal women. Itchy skin is a very frustrating symptom, due to its chronic nature and the fact that if you indulge in scratching, injuries may ensure. Learn more.